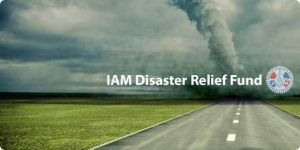 The IAM Disaster Relief Fund provides assistance in situations where our members and their families endure hardships due to natural disasters. The IAM reacts quickly to these needs before other sources of assistance are able. This is not possible without the support of those who have committed to keeping the IAM Disaster Relief Fund vibrant and healthy. Thank you for your contribution and all you do! The killer EF-4 tornado which took 23 lives on March 4, 2019, in Beauregard, AL reminded us once again that natural disasters can strike at any time. IAM International President Bob Martinez recently visited Panama City, FL Local 1106 members at WestRock mill and Local 449 members at Tyndall Air Force Base.